Manufacturer of a wide range of products which include dome sticker. 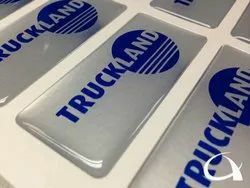 Dome Stickers are the best way to introduce your brand name Dome labels have a crystal clear material poured over your design. Industrial printing requires accuracy, cleanliness, and attention to detail. Our motive to fulfill the customer/industry requirement with quality.